It's time for the Knicks to press the reset button, trade Carmelo Anthony and start from scratch. NEW YORK – Just when you thought you had seen it all, when you thought the dysfunctional Stephon Marbury/Larry Brown Knicks were as bad as it could get or that Mike Woodson’s soulless campaign last season was rock bottom, you get this: the 2014-2015 Knicks, basketball’s Chernobyl, a team that came into the season brashly predicting the playoffs, yet are on pace, incredibly, for the worst season in franchise history. The Knicks were blown out by Houston on Thursday, a nationally televised pasting (Note to TNT: If you had the opportunity to flip Knicks-Rockets for Hornets-Raptors weeks ago, you should have taken it) that dropped James Dolan’s bunch to an NBA-worst 5-34 on the season. The Knicks haven’t won since mid-December, have not put together two straight since the second and third games of the season and have now lost seven straight games by double-digits. Injuries are a factor -- the starting lineup of Jose Calderon, Pablo Prigioni, Tim Hardaway Jr., Jason Smith and Cole Aldrich would have trouble beating Houston's D-League affiliate, much less the Rockets -- but the Knicks have been mostly healthy at various times this season and have not been much better. A month before the All-Star break and the fan base has surrendered. The Garden is still packed -- the Knicks are fourth in the NBA in average attendance at just under 20,000 per game -- but the energy has been sucked out. Lusty boos have been replaced by sighs of indifference. The five fans covering their heads with grocery bags Thursday was the only notable sign of disgust. Said Derek Fisher, "[Fans] have every right to be disappointed in the team if you feel like the effort, the energy, the fight is not there." It's not. It’s astonishing that it’s reached this point, really. Phil Jackson supposedly stabilized the front office and Fisher brought a strong, albeit inexperienced voice to the sideline. No one expected the Knicks to be conference contenders this season. But in the Eastern Conference -- the Eastern freaking Conference -- where the last two playoff spots could go to teams with sub .500 records, getting into the postseason wasn’t some Brobdingnagian task. It’s Monday morning quarterbacking, because like most, I was in favor of the Knicks bringing Melo back on a max deal for multiple reasons. First, Anthony is an ideal big market star. He’s mentally tough and able to withstand the daily (hourly?) off-the-court pounding from relentless media. Melo is a rare player who can shoot 1-of-15, take a public flogging and not allow it to affect him the next night. He’s not afraid to shoulder the burden of carrying a team. Ask any executive who’s worked in a big market; these are qualities that should not be discounted. Moreover, of all the problems the Knicks had last season, Anthony wasn’t one of them. Carmelo averaged 27.4 points on a reasonable 45.2 percent shooting. He played in 77 games, connected on a career-best 40.2 percent of his three-pointers and a career-high 84.8 percent of his free throws. No, he didn’t defend and there were times he looked like an honors student at the Lance Stephenson School of Looking Off Open Teammates, but he played hard and was the reason the Knicks weren’t exponentially worse. But the more you see what the Knicks are, the more you wonder: Was giving Anthony a five-year, $124 million deal the right move? Anthony is 30 and battling knee problems that will likely limit him the rest of the season, if not longer. His bruising, below-the-rim style and strong post game suggests that Anthony will age better than some high flyers but it also means the wear and tear Anthony has built up playing that way for 12 years could start to slow him down. Then there is the triangle. To be fair, no Knick appears comfortable in Phil Jackson’s favored offense. Sets are sloppy and key tenets -- specifically multiple passes, crisp cutting -- are often ignored. Jackson obviously believed Anthony could assume the Michael Jordan/Kobe Bryant role in the system when he re-signed Anthony this offseason, but there are no indications to this point that Anthony is equipped to do that. He has spent his entire career as a ball-stopping scorer; it’s going to be hard to change him into a ball-moving one. Unless Jackson decides to free Fisher to run a different system -- and there are no indications that’s coming -- it’s going to be tough to make Melo fit. The Knicks thinking here was obvious: Bring in Calderon, a smart point guard who can make three’s and run the offense. Forking over Chandler was a steep price, but the Knicks were a woeful No. 24 in defensive efficiency with Chandler last season and there was considerable uncertainty as to whether the free-agent-to-be would be back after this season. Plus, there was hope that Samuel Dalembert could provide a measure of rim protection in Chandler’s place. Again, it was a move few vehemently disagreed with. This one didn’t work, either. It would have been nice to see what Calderon could have been had a calf injury not robbed him of the first few weeks of the season. But he has struggled. His turnovers are up while his assists, field goal percentage and three-point percentage are down. Dalembert -- who was unceremoniously cut this week -- was a disaster, a liability on offense and a non-factor on defense. It’s been noted here before, the Knicks strong points in the paint numbers (38.6, No. 2 in the NBA) are not in indicator of a strong interior D, rather a foul-prone bunch that distributes the points between the free throw line and undefended three-point territory. Dalembert’s inability to offer anything defensively was a big part of that; Knicks officials privately grumbled about Dalembert’s bad attitude and poor work ethic. It’s doubtful Chandler would have made a notable difference; he was disenchanted by the downward spiral the organization was on and appeared ready to move on anyway. But the Calderon/Dalembert acquisitions have not had the desired effect. So what does Jackson do? There’s no quick fix. The Knicks love to talk about cap space, which they expanded for this summer by ridding the roster of the $6.4 million J.R. Smith is owed this offseason. But who is going to fill it? Marc Gasol is a pipe dream; the Memphis center isn’t leaving more money and a winning situation in Memphis to rebuild with the Knicks. Rajon Rondo is a free agent, but there is a strong belief around the league that Rondo and the Mavericks are on the same page with what it will take to bring Rondo back to Dallas. LaMarcus Aldridge has pledged his allegiance to Portland and if Kevin Love relocates, it probably won’t be to New York. The Knicks could overpay for Greg Monroe or Roy Hibbert (who can opt out of his deal with Indiana), but there will be competition for both. Here’s a reality: The big market Knicks need to act like a small market team. That could mean trading Anthony. Melo probably has 2-3 prime years left. There would be strong interest in him from contenders that pursued him last summer (Chicago, Houston, L.A.) and the Knicks could recoup a draft pick or two, some young talent and shorter contracts. It’s ugly, but with few exceptions (Boston, Miami) true contenders are built patiently. Washington gutted its roster, bottomed out, and now the Wizards are one of the top contenders in the East. Oklahoma City struggled through losing seasons before becoming a perennial contender. Teams like Boston and Orlando are struggling now, but they have the picks and young talent to piece together a consistent winner long before the Knicks do. That puts all the pressure on Jackson. Forget free agency; Jackson’s legacy in New York will rest on what he does with this upcoming top-five pick. Franchises rise and fall with draft hits and misses. For every Anthony in the top-five there is a Darko Milicic; for every LaMarcus Aldridge there is a Tyrus Thomas. Jahlil Okafor looms as the most sure thing in June’s draft, but after that it’s a collection of raw talent. The biggest decision Jackson will make will be deciding which player has the tools and temperament to develop into an NBA star. Patience is not something Knicks fans have much of, and justifiably so. It’s been 42 years since the Knicks won a championship and 16 since they have been to a Finals. They have been teased with hope from Isiah Thomas and Donnie Walsh. Now Jackson is no closer to competing for a title than before any of them were hired. But slapping together a handful of pricey, second-tier free agents to team with Anthony in an offensive system that takes years to learn isn’t a solution. A slow, smart rebuild is. A Western Conference scout on Cleveland’s acquisition of Mozgov after surrendering two first-round picks for the center. They need him. They weren’t getting out of the second round without him. He’s probably being overrated about all the things he will bring to them, but he fills an obvious need with [Anderson] Varejao gone. He’s an average defender but he is a decent rim protector who will rebound and block a few shots. He’s a presence. David Blatt knows him, so he should be able to work himself into the mix quickly. ​They gave up a lot for him though. When I heard two first-round picks, I said ‘Wow.’ It’s not that I don’t like him and I understand that he is under contract at reasonable money for next season. But we’re not talking about a franchise-type center. He’s not even the defensive-minded guy I think that Kevin Love needs to play next to. But they needed to win now. LeBron probably wants to win now. It seemed a little desperate, but maybe that’s what they are. When Dallas traded three players and a first-round pick to Boston for Rajon Rondo last month, it wasn’t looking for the pedestrian playmaker who had been sleepwalking through the last two seasons. The Mavs wanted the menacing floor leader who helped the Celtics win a championship in 2008 and was outperforming Kevin Garnett and Paul Pierce in the postseason by 2011. So far, the Mavs are seeing the latter. 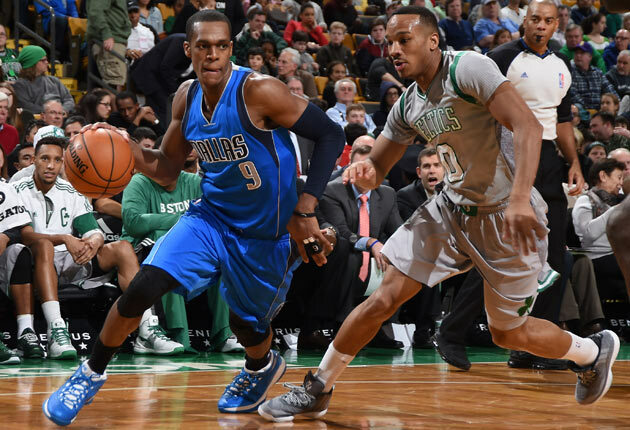 Rondo has been solid in his first few weeks in Dallas, leading the Mavs to a 7-3 record in his first 10 games. Some of his production is familiar (8.2 assists) while some is startling, none more than the 44.4 percent Rondo is shooting from three-point range, a number boosted by the five three’s he made in his return to Boston last week. After making waves for saying he didn’t play much defense the last two seasons, Rondo has tightened up. He held Kyrie Irving to six points (on 2-of-9 shooting) in a win over Cleveland last week; he helped hold Russell Westbrook to 18 points (on 6-of-23 shooting) in a win over Oklahoma City last month. Opponents' offensive rating when Rondo is on the floor is 97.4; when he is off, that number jumps to 108. The hope in Dallas is that Rondo is fully integrated by the postseason, where he has emerged in recent years as an elite performer. And after spending a few weeks with him, Carlisle has little doubt he will do just that. "When in doubt, shoot the ball." -- New Cavs guard J.R. Smith when asked about the challenges of digesting a new playbook midseason. Just what a Cavs team that has massive problems with ball movement needs. "I told him he was just being lazy." -- Nets coach Lionel Hollins on Brook Lopez, after Lopez was beat down the floor for a loose ball in Brooklyn's loss to Boston on Wednesday. It's the latest chapter in the tumultuous relationship between Hollins and Lopez. The tough love that Hollins effectively used on Marc Gasol and Mike Conley in Memphis doesn't seem to be resonating with Lopez. Kings center DeMarcus Cousins spent part of Thursday signing printouts of tweets from fans advocating Cousins for the NBA All-Star team. An interesting way to drum up support. Where has Toronto’s defense gone? The Raptors were No. 10 in defensive efficiency last season; this year, they have fallen to No. 22, and last night surrendered 103 points to an Al Jefferson-less Hornets team. Toronto has more than enough offense to contend, but it won’t get past any of the top teams in the East unless the defense improves … The Hawks announced that "100 percent" of the team -- plus operating control of Phillips Arena -- is officially for sale. Early buzz is that the team could fetch $700-$800 million. But don’t be surprised if a bidding war pushes the price to close to $1 billion … Five straight 20-plus point games for Andrew Wiggins. That’s not enough to make Cleveland regret the Kevin Love deal (yet) … Seven straight wins have the Pistons within 2½ games of a playoff spot. You have to love the East … Pretty clear at this point that Memphis is determined to get a small forward before the trade deadline. Luol Deng probably isn’t available, but Jeff Green in Boston is. The Celtics asking price is high -- believed to be a first-round pick -- but with Green potentially headed for free agency this summer (he has a player option for $9.2 million next summer) the asking price could dip deeper into February … Dion Waiters could be a huge pickup for Oklahoma City. Waiters was a disaster this season in Cleveland but if he accepts his role with the second unit, he can get plenty of opportunities to score. That would take enormous pressure off Kevin Durant and Russell Westbrook, who carry a heavy burden offensively.